Change is hard. Attaining true freedom is harder. 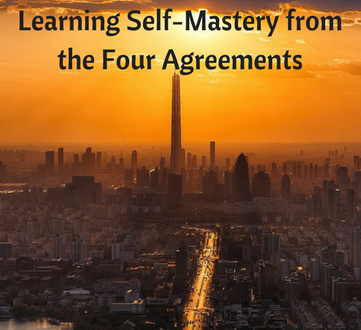 When I was gifted “The Four Agreements” by Don Miguel Ruiz, I didn’t know what to expect. Examining inside the back cover, I found out that Ruiz is a Mexican author who emphasizes Toltec spiritualism, an ancient belief system founded over a thousand years ago in Mexico. According to Ruiz, the Toltec were “scientists and artists who formed a society to explore and conserve the spiritual knowledge and practices of the ancient ones.” The Toltec were masters of the self, full of wisdom, and excelled at uncovering the keys to a balanced life. The four agreements hit hard at your greatest faults and insecurities. Often, you might not even know that it’s your mindset that’s holding you back in life. That is why understanding and adopting the agreements is so crucial. Words are powerful, and the way we use them is crucial. Most people use their words to cast doubt on us, or to complain about their own lives. Most people care little about our difficulties in life, and instead choose to give us their opinion on things time and again. However, it’s important we use words the right way – to build ourselves up and to make a positive impact. Lots of people do one of two things with words; use them to self-loathe or use them to degrade other people through gossiping. Both of these actions are poison. You should always be focused on self-improvement, and this begins with powerful, positive beliefs. When we focus on other people, we suffer from envy, anger, even hatred. We let jealousy ruin our relationships and let opinions dominate our thoughts. It’s human nature to have doubts. It’s natural to gossip about others. But you must limit these weak moments. It’s self-destructive to always doubt yourself, but it’s even worse if you let the opinions of others get to you. Nothing others do is because of you. What others say and do is a projection of their own reality, their own dream. When you are immune to the opinions and actions of others you won’t be the victim of needless suffering. How often do you try to get even with someone who wronged you? We’ve all been there before. But as Ruiz writes, “Personal importance, or taking things personally, is the maximum expression of selfishness because we make the assumption that everything is about ‘me’.” What you fail to realize is that most people are dealing with their own issues when they lash out at you. The key is to not take things personally. Once you master this ability, life becomes much more relaxing. You are at ease with people because nothing they can say or do will bother you. If you are someone who is always offended, then you are doomed to a life of misery. You need thick skin in order to thrive in today’s world. As political correctness invades our college campuses and schools, it’s never been more important to be able to shrug off someone’s comments. Too many people melt in the face of self-perceived insults, and it wrecks their mindset. We each have our own unique point of view on things, so naturally there will be times in which we disagree with others. But it’s your choice to be offended by such disagreements. According to Ruiz, “When you take things personally, then you feel offended, and your reaction is to defend your beliefs and create conflict.” Instead, remind yourself of your core beliefs and strong sense of self. If you don’t have the need to always be right and accepted, then you will gradually care less and less what people say about you. There is a huge amount of freedom to be gained by not taking things personal, but you first have to change your mindset. Assumptions can be deadly. How often do you act without all the facts? How many times have you inferred or come to a conclusion without all the facts? Certainly, there are times where we need to make a quick judgement call. But we have allowed our minds to become lazy – to simply fill in the blanks based on our experiences and inherent biases. This is especially prevalent in relationships. You argue because you are assuming the other person knows what you want. “We make assumptions about what others are doing or thinking,” says Ruiz, “we take it personally, then we blame them and react by sending emotional poison with our word.” You misinterpret the facts by making assumptions. It’s the classic case of jumping to conclusions based on faulty logic. When you do this, you see and hear whatever makes your viewpoint the right one. It’s impossible to guess what’s going on with someone else. But instead of making assumptions, ask questions. Try to understand them. Open lines of communication, whether personal or business in nature, is key to success dialogue and relationship building. You bring a ton of unnecessary drama and stress into your life by making assumptions. Remember: People change because they want to change, not because you want them to. It’s important to not impose your will on others, and instead let them seek out change and improvement on their own. By having realistic expectations, you are ensuring you don’t fight over nonsense. It’s important to stay positive even when times are tough. It’s easy to discouraged when it feels like everything is going against you. You will be successful if you give your best effort every single time. It might not happen overnight, but you are creating rock solid habits that will eventually shape the way you think. You will cultivate an intense drive and sense of purpose. Learn from your mistakes and do your best to improve and grow, not for the potential reward if you are successful. People who are interested in the reward and nothing else struggle to sustain their best efforts because they don;t enjoy the process. The struggle to motivate themselves to action, and thus their work suffers. If you love the process and work hard, the reward will come. Repetition makes the master. Start today and live tomorrow.